Coenzyme Q10 is a powerful antioxidant and an essential component of the mitochondria – the energy-producing units in every cell of our body. CoQ10 levels decline with advancing age, and this might contribute to some of the signs of aging. People in their twenties and younger almost always have adequate levels of CoQ10, whereas deficiencies are common in people forty and beyond. Regular exercise and a diet that’s low in trans fats, low in refined carbohydrate, high in vegetables and contains “good” fats are the pillars of a heart healthy lifestyle. However, enhancing the function of the heart itself is an important part of preventing and treating cardiovascular disease. 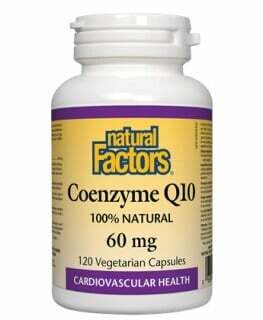 When it comes to heart-health nutrients, Coenzyme Q10 tops the list. Also known as ubiquinone (a reference to its ubiquitous presence throughout the body), CoQ10 is a fat-soluble, vitamin-like substance that acts like a cellular spark plug by providing energy to our cells. Since heart muscle cells are always working, their need for CoQ10-derived energy is higher than that of any other tissue. Statin-type cholesterol-lowering medications decrease the synthesis of CoQ10 and taking a statin drug is the number one reason to supplement with this nutrient. 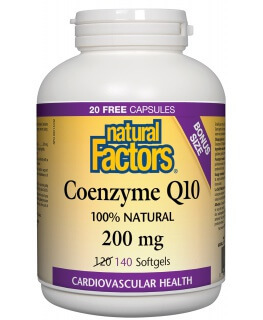 Taking 100 to 200 mg of CoQ10 daily is essential for anyone with high blood pressure, congestive heart failure, angina, or any other heart problem. Through supplementation with CoQ10, there is improved energy production in the heart muscle, leading to improved heart function. CoQ10 continues to amaze researchers with its ability to improve a variety of health conditions, especially as we age. 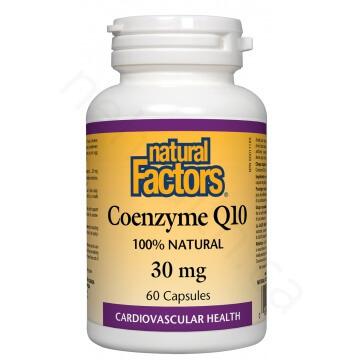 In addition to its benefits for the heart, CoQ10 enhances immune function and may be effective for diabetes, gum disease, male infertility, and some forms of cancer. 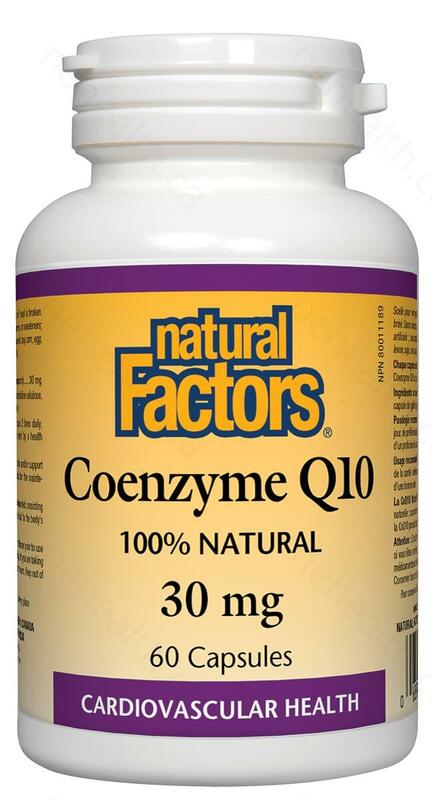 What Are the Key Health Benefits Associated with Coenzyme Q10? 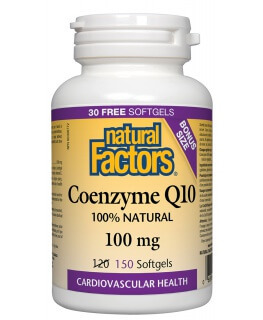 What Makes Natural Factors Coenzyme Q10 Unique? Non-medical ingredients: Microcrystalline cellulose, capsule (gelatin, purified water). Adults: Two Softgels 2 times daily or as directed by a health practitioner. Serious cardiovascular and neurological disorders: Higher dosages may be appropriate. Parkinsons’s disease: Benefits the most with a dosage of 1200 mg per day. ALS (Lou Gehrig’s disease): As much as 3000 mg of CoQ10 daily has been used for eight months. Consult with your health practitioner. Pregnancy and Lactation: Due to lack of studies, safety during pregnancy and lactation has not been determined. Numerous studies have concluded that CoQ10 is remarkably safe, even at high doses over a long period of time. There has been one case where CoQ10 interfered with warfarin Consult with your health practitioner if taking this drug. Sarter, Barbara. "Coenzyme Q10 and cardiovascular disease: a review. "Journal of Cardiovascular Nursing 16.4 (2002): 9-20. Parkhideh, Daryoush. "Methods and compositions that enhance bioavailability of coenzyme-Q10." U.S. Patent No. 7,438,903. 21 Oct. 2008.